Editor’s Note: This is not an endorsement of Grimes — who is a punk dating a talking garbage can. Vogue covered the outfit. Grimes may be trendy, but she is only the most visible and vocal of people smitten with the aesthetic of From Software’s “Soulsborne” super-series. From has long been quietly setting the bar for fashion in games. Best known for punishing combat and dense, nebulous lore, Dark Souls may seem an unlikely candidate for displays of sartorial flair. It was the gameplay formula, after all, that spawned a genre. The brood of Souls-like titles that followed kept the grim atmosphere and brutal gameplay mechanics, but largely ditched the fashion. Like the conspiratorial lore and meticulously-crafted environments, the sartorial aspect of these imagined worlds has always been a cut above the competition. The looks of Lordran or Yharnam, the central locations of Dark Souls and Bloodborne, are just as refined, singular, and confidently-executed as the combat that cuts through them. Of course, plenty of games have distinctive fashion. There’s the contemporary streetwear of Splatoon, the enlightenment kink of NieR: Automata, the codeine fever dreams of Fortnite fashion, and Destiny’s guardians, who all suit up in some variation of Footlocker chic. I guess there’s lots of activewear in the future; also everything is shiny. 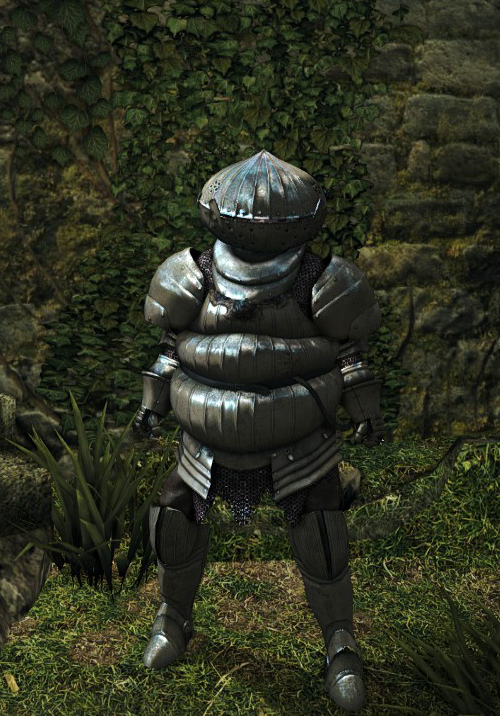 The fashion of Dark Souls is often more sophisticated. Its designs always had a bit of the runway about them. They do more than mindlessly adhere to the aesthetic of a brand, or give players a big wardrobe. 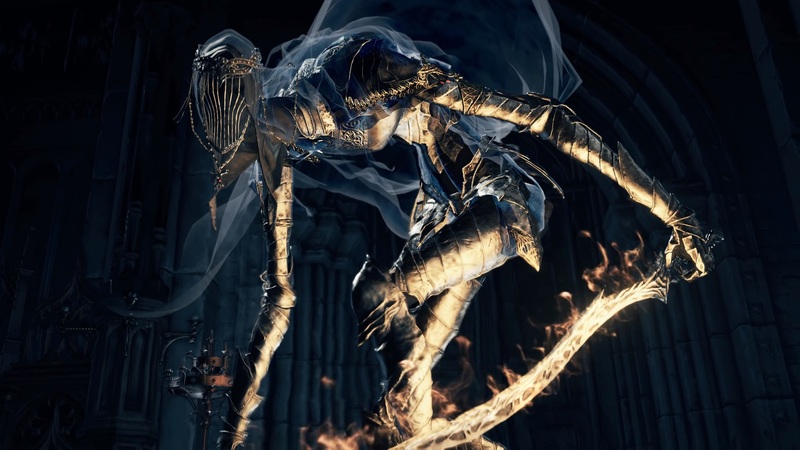 Like the boldest runway shows, Soulsborne fashion delights in subverting expectations. It embraces the forbidden, the hermetic, and the opaque. The looks of the Soulsborne games are experiments in silhouette and mood; and every set of gear hints at a buried story that must be excavated by the player. Dark Souls draws on tired tropes of Eurocentric fantasy, the bold designs of manga like Berserk, and the dramatics of impractical JRPG armor, but what it offers is much more than a potpourri of influence. By challenging its predecessors, its fashion ultimately has far more in common with the avant-garde designs of the late Alexander McQueen than Geralt’s trusty witcher gear. Consider the iconic Catarina set. Its plate mail resembles slick rolls of fat, an inexplicably gratifying reversal of the typical warrior’s brawny silhouette: Winnie-the-Pooh as knight-errant. Then, in boss design, the same trope is reused for Executioner Smough’s armor. 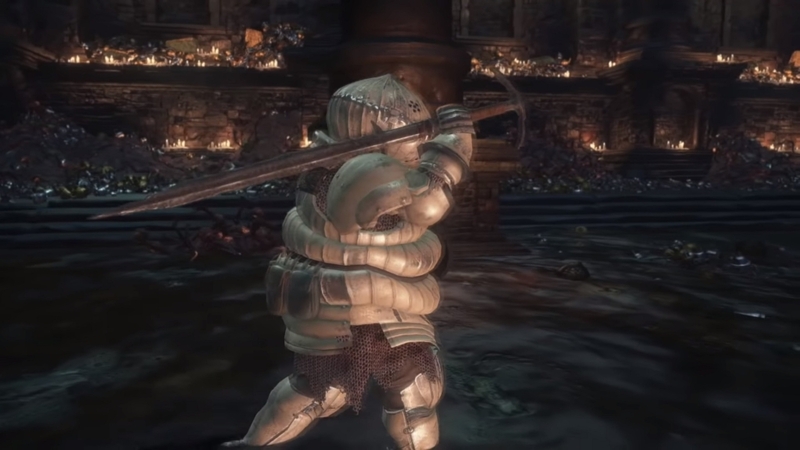 Only this time it’s in reverse: his tiny masked head and bulging gut are a grotesquerie we’re meant to find revolting by comparison to the dashing and ornamental Dragon Slayer Ornstein at his side. 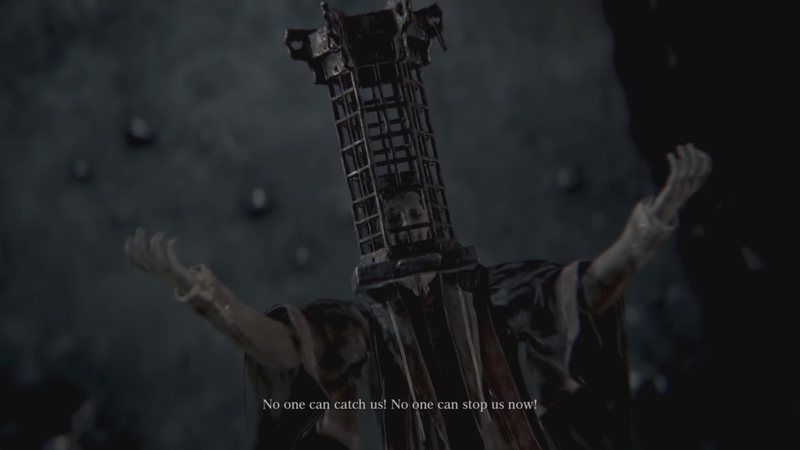 Dark Souls gets even weirder from there. The Xanthous Set is the nightmare of a turban — a giant teetering pile of saffron bandages — paired with a crop top. It’s an outfit that straddles the line between comedy and terror. What kind of person would don such a garment? And why? You could craft entire lore theories around this single element of a wardrobe. Bloodborne only continued the escalation of disorientation and hidden meaning around its fashion. Players can wear a shimmering mask that has no openings for eyes or a mouth that recalls the Margiela headgear seen on runways a few years back. NPCs and bosses sport bandages over the eyes. Finally, players can wear a cage that fits neatly around the head. The Mensis Cage, with its symbolically-charged name, is a profoundly cool piece of headgear. Its confinement evokes both the isolation of mental illness and the game’s Gnostic themes; it is simultaneously restraint and cosmic antenna — a direct connection to the divine. High fashion plays with the confinement of the body in similar ways. Alexander McQueen’s collections repulsed and offended people, but his lobster claw heels and harnesses showed that constraint can be a potent source of power — and, in the case of the Mensis Cage, even ascension. The cage is hardly a prop or a bit of loot earned from a fight. It challenges the player as a macabre joke that expresses desperation and pessimism as much freedom and joy. Like the best high fashion, it shows that the body has never been a neutral space on which to drape nice fabric, but a battlefield on which there is a constant confrontation of values. In that view, the Mensis Cage is visual metaphor — a synthesis between madness and transcendence that neatly summarizes the entire game. Excellent fashion in games will never be about the cool stuff in your virtual closet, that new zombie skin, or the shiniest shader. It’s more than cape and hair physics. It’s designs that show the world as it is: a place neither safe nor reassuring, and from which clothes can hardly protect us. We’ll see soon enough whether Sekiro, From’s upcoming endeavor, has the visual flair to interrogate and redefine the old-school shinobi look. There is no compelling financial reason for developers to lavish such care and attention on what many consider superficial details (at least not in games like Dark Souls, which don’t sell you copious cosmetic DLC). 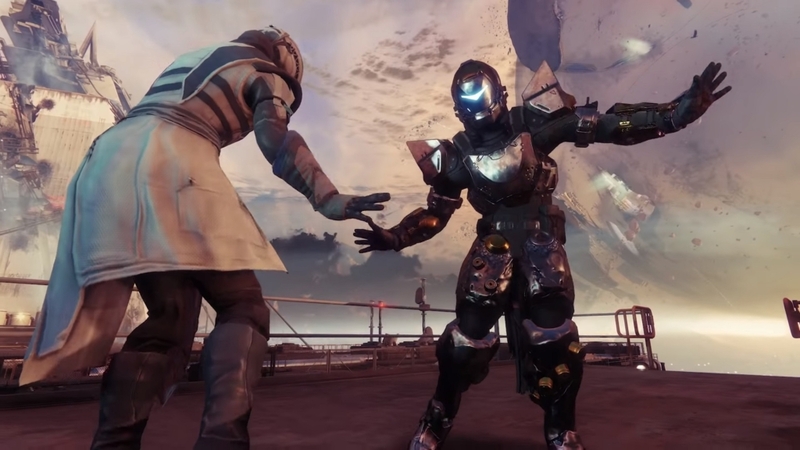 But as games become ever more dominant in the broader cultural conversation, their fashion should offer alternatives to a homogeneous landscape of chain mail and spacesuits. By that measure, Dark Souls is a provocation. Its fashion unsettles us, engenders our curiosity, and stands as a benchmark going forward.